José Padilha's Bus 174 (2002) is particularly remarkable for editing (credited to co-director Felipe Lacerda). The film pulls together a wide range of documentary elements to explain (but not excuse) the brutality of a young kidnapper, Sandro de Nascimento, who held several passengers hostage at gunpoint on a bus in Rio de Janeiro, Brazil in June of 2000. The filmmakers use television footage of the kidnapping for the basic storyline of Bus 174, often cutting away to sequences explaining Sandro's background (he lived on the streets after witnessing the murder of his mother, for example) and documenting the terrible local conditions for both homeless street kids and people in jail. Sandro himself foreshadows his own fate when he calls attention to the massacre, at the hands of the police, of several street children at Rio's Candelária church (bottom still). Peter Raymont's Shake Hands With the Devil: The Journey of Roméo Dallaire (2004) is a deep and harrowing character study about one man's continuing internal struggle with his past command of the United Nations peacekeeping force during the Rwandan genocide. Raymont's observation of Roméo Dallaire's psychological state is a counterpoint to the film's well-edited history lesson. The April 1994 departure of Belgian troops, for example, is one of many low points (bottom still). Despite Dallaire's modesty, the film unambiguously establishes his heroism using archival footage and recollections from witnesses and colleagues. Yung Chang's Up the Yangtze (2007) is a nuanced and emotionally resonant film about modernization and change in China. The film is like a morality fable for strivers, centering on the stories of two key characters: an innocent (Cindy, top still) and a huckster (Jerry). They have just begun their jobs on a cruise ship (their boss gave them their tourist-friendly names) for foreign vacationers curious about the rising Yangzte River. The film succeeds because of its perceptive portraits of people even more than its informative views of river and riverbank. Yung Chang provided information for a follow-up web page -- anyone who watches the film will want to find out what happened next for Cindy and Jerry. Stanley Nelson's The Murder of Emmett Till (2003) was made for the public television documentary series "American Experience." The film's powerful storytelling is particularly outstanding in its portrayal of Emmett Till's mother, Mamie Till (above). She is the key carrier of the narrative of the events in 1955 that led to her son's death and the sham trial that followed which set free the two white men who murdered him. Mrs. Till personifies the moral and spiritual meaning deriving from Emmett Till's murder. Her presence in the film, in contemporary interviews and archival footage, also represents the passing of time. Pare Lorentz made The Plow That Broke The Plains (1936) as part of the Roosevelt administration's documentation of the United States during the Great Depression. Several cameramen worked on the project, among them Leo Hurwitz, Ralph Steiner, Paul Ivano, and Paul Strand. American composer Virgil Thomson wrote the music. Many of the visuals remind me of FSA photographs from 1930s Dust Bowl, such as the scene of a family digging out from drifting sand dunes (top still). 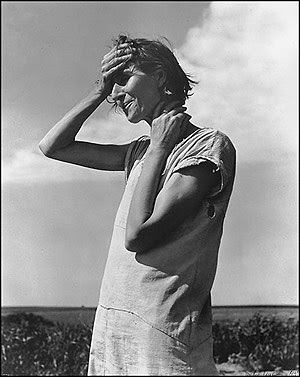 A farmer's wife (middle still, from The Plow That Broke The Plains) stands with her hand to her head, as does "Woman of the High Plains, 1938" by photographer Dorothea Lange (bottom still, © The Dorothea Lange Collection, Oakland Museum). Southern Comfort (2001) is a documentary about a mutually supportive group of transgender friends, one of whom, Robert Eads, has ovarian cancer. Kate Davis shot much of the film on her own, using a camcorder. Reflecting on its success in an interview with Amy Souza, she said "'Southern Comfort' is an example of finding a story and just going and taking a small camera and doing it." The film shows the closeness and access that is often the outcome of "one-man crew" productions. The editing and storytelling make use of months of shooting: no outside narrator is needed, well-paced reveals drive the narrative along, and an array of characters, chain smokers all, are fully formed. Susan Steinberg's Atlantic Records: The House that Ahmet Built (2007) is tremendous fun. The film lionizes Ahmet Ertegun, who founded Atlantic Records based on his love for African American music. Among many other musicians, the film includes Big Joe Turner (top), Ray Charles (middle, with Ertegun), and Duke Ellington (bottom; a young Ertegun at left). Ertegun's musical interests later encompassed white pop, and the film follows along, ambitiously departing from straight hagiography toward analysis of the interplay between "black" and "white" music.